True to the forecast, it has been a rainy, wet Sunday, which is just fine by me. It washes the pollen out of the air, it cleans the dust off of everything, and it makes for some excellent sleeping conditions. After spending the morning in my reading corner with my Kindle, catching up on a book that I’ve been pecking away at, I decided it was time to get out of the house for a little bit. There was a break in the shower activity, so I picked up the Nikon, mounted the 75-200mm zoom lens, grabbed Andy who volunteered to carry the umbrella in case we needed it, and we took off for a walk around the neighborhood. It was still very overcast, so the lighting wasn’t the best for many of the shots, but what’s that got to do with anything when you have photo-editing software, right? Anyway, I was concentrating on composition today, which led to me getting into some pretty awkward positions trying to capture shots of plants and flowers that were low to the ground. Glad there weren’t that many people around! The raindrops on the plants produced some really nice images, especially when viewed large. 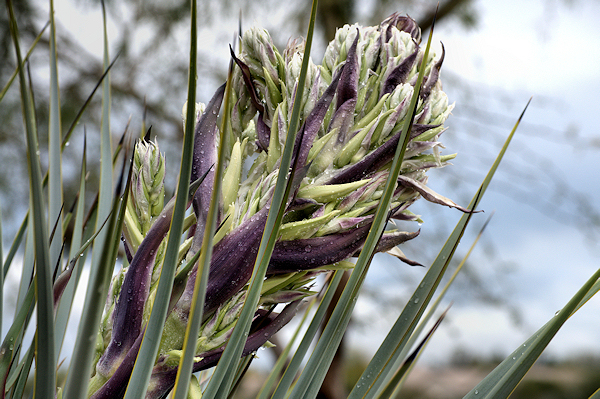 The image above is a partially opened bloom on one of the large succulents that is growing by the sidewalk near the subdivision behind us. As we saw yesterday, so many of the plants are starting to bloom now, especially with all the rain that we’ve had. 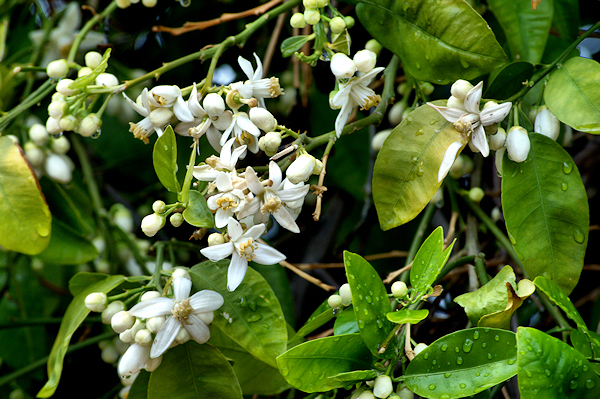 The citrus trees have started to bloom this week–it’s one of the true pleasures of living in this area, getting to smell the lemon, orange, and grapefruit blooms each spring. It’s heavenly! The shot below if from a grapefruit tree in a neighbor’s yard. I really enjoy walking outside after it rains, and having a camera along reminds you to pay attention to the details of things that you would normally overlook. We were outside for about a half-hour, and just after we got back to the house the rain started again. Sometime this summer, I’ll look back at this day longingly, I’m sure! 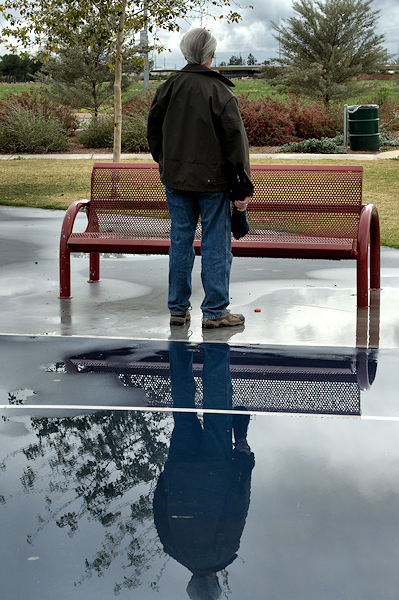 Andy reflects while being reflected. I posted a dozen of my favorites to Flickr in the set titled “Rainy Sunday in the Neighborhood“. Drop by and check them out and let me know which is your favorite! This entry was posted in Shooting and tagged Arizona, AZ, camera, cloud, D5000, Glendale, Nikon, Paint Shop Pro, park, Photomatix, rain, storm. Bookmark the permalink. I really like the perspective in “Color in the Park;” nice composition. I’d maybe bring down some the highlights, though. I tend to go for darker images. The bokeh in “Entwined” is really phenomenal; I’m digging it. And “Ready to Burst Wide Open” is cool. I like the water droplets. I’d probably increase the saturation, but I also try too hard to get my colors to “pop.” Great shots!